Five-roomed villa of 100 square meter composed of: entrance, living room with fireplace, TV, stereo and single bed-settee, kitchen with refrigerator, freezer, oven, microwave oven, toaster, kettle, coffee maker, small balcony, ample double bedroom with en-suite bathroom with cabin-shower and direct access to a sea view balcony, ample bedroom with two single beds, bedroom with one single bed, another bathroom with bath and shower. Going up a winding staircase you reach the sun terrace of 100 square metres with sea view overlooking the island of Ischia and Capri, equipped with table, umbrellas, beds and lounge chairs for the use of guests. Sleeps five to six. Free WI-FI Internet available. Sorrento Coast Villa is situated in the nicest area of Sorrento Peninsula, a few minutes to Sorrento, in the little town of Massa Lubrense and is far just 300 meters (5 minutes by walking) from shops, grocery, supermarket bars and the characteristics restaurants where you can taste local food and wine. If you would like, car is not necessary to discover Sorrento and Amalfi Coast. From the villa there’s a well linked bus transportation system. The bus stop is at 5 meters from the villa At the villa you’ll find the timetable for buses, ferry and train. Free public car parking at 20 meters. Beaches at 1,5 Km. 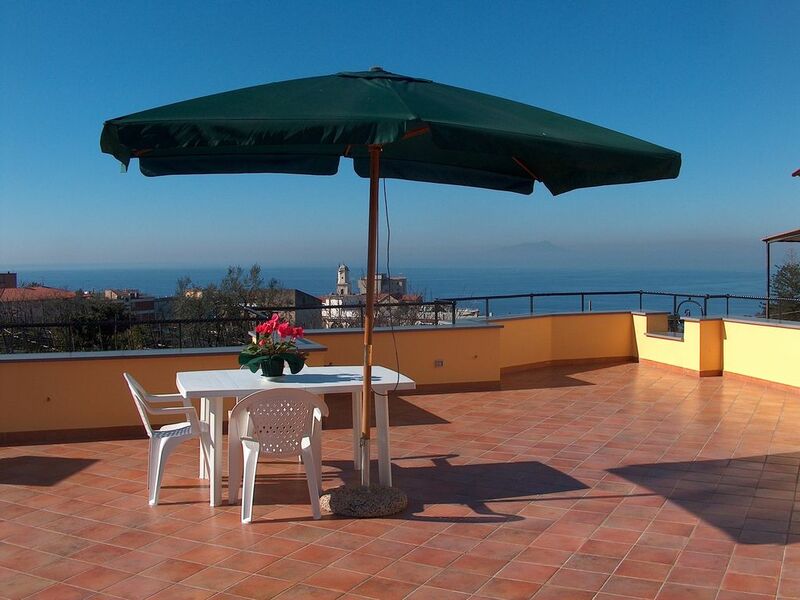 Sorrento Coast Villa is far just 5 Km from Sorrento Center. With the bus you can reach easily Sorrento Centre (bus run each 20 min - ticket euro 1.30) and railway station for excursions to Pompei (30 min), Ercolano, Napoli (1 hour), Roma or other location, Positano, Amalfi (1 hour). From Sorrento harbor there's direct hydrofoil to Capri (20 min), Naples (40 min) and Ischia (45 min). We very much enjoyed our stay in the villa. It was very comfortable with a well-equipped kitchen and two bathrooms. There is a footpath to access the centre of Massa Lubrense in just a few minutes. The owners were very welcoming. The location is great for visiting the beautiful peninsula. Thank you for choosing us, appreciating the beauty of the villa and the area and all our ospitality. We are happy to have made your holiday wonderful. Hope to see you again in our villa. The rental was amazing! It was above Sorrento and out of the tourist trap! We were able to come to the heart of the city within 20 minutes but did not have to stay in the heavily populated area. Our hosts were kind and helpful! We were met with homemade Lemon cello from our host's lemon orchard. I would recommend this site to any one. I will absolutely go back to this property in the future! Thanks for your valuable review, we hope to see you again for another wonderful holiday. Loved everything about this home ,,, it was Imaculate! Thank you for your nice review. It's nice to help our guests and make their holiday fantastic and unforgettable. We enjoyed our stay at this property - we were group of 4 friends so there was plenty of space. Our hosts were very attentive and helpful with any queries that we had. Serena replied to our messages without delay and helped us to arrange our trips. The property itself was clean and well kept. All the facilities were working well. The property had a balcony from which we could sit in the evening and enjoy the sun set. It is essential to have a car if you are staying here as the nearest restaurant and supermarket is a good walk away and I am not sure about the public transport . If you want to go on any trips then you can arrange to be picked up by a cab. We did have a car and it was a good place as a base for our visit to Sorrento, Amalfi Coast & Pompeii. Massa Lubrense is a quiet town with not many tourists - seemed to be mostly locals in the town - so we enjoyed the quiet. There is not a lot to do in the actual town but it is a great place to have a base for travelling around the area. We had a little difficulty finding the place on the first day so I would recommend that you take proper instructions of how to get there - the postcode co ordinates did not work in the Google Maps app. Overall it was a very comfortable stay and we would definitely recommend it . Thank you to Mary & Serena for your help. Thank you for lovely description of your staying in our villa. Massa Lubrense is in a privileged panoramic position at the extreme tip of the Sorrento Peninsula among the most famous tourist destinations in Italy. The charm of the village combined with the beauty of the tourist areas around us, famous worldwide, makes it unique and wonderful stay to our guests. We will be happy to welcome you again. Thank you. This property is beautiful and well maintained. The host family is helpful and charming. The wi-fi is a bit iffy, (at least for someone who was working while on vacation) which was mentioned before but we thought we'd take a chance. It is a great location. However, one of the larger bedrooms is right on the main street, literally, with the window opening on the street side. If you need the windows open for ventilation (there is no air conditioning), that bedroom is extremely loud from autos and scooters, as well as much exhaust, so sleeping in it is not possible. If you don't need that bedroom, (it has 2 large + 1 small bedroom) or you are traveling when it is cooler, this would be a wonderful place to stay. We had 5 adults in September and had to move because of the noise and exhaust. If it wasn't for that, and the iffy wi-fi this would be 5 stars, no question. We thank you for the nice description of our villa and of our hospitality. We will always be happy to meet all the needs of our guests promptly. Therefore we invite our future guests to contact us during their stay for any need. In fact we had other fan in storage that we could supply you and could check the good functioning of the wi-fi. Wonderful stay for a week end of August 2018. Villa is excellent well equipped and clean. Hosts Luigi and daughter Serena are very helpful and friendly, nothing is too much trouble for them. The views are amazing and the transport bus routes are close to reach all sightseeing places. Would recommend this villa if wanting to visit Sorrento it is truly a lovely area. Thank you for choosing us, appreciating the beauty of the area and all our ospitality. Thanks again, we are happy to have made your holiday wonderful. The Villa is situated in the nicest area of Sorrento Peninsula, a few minutes to Sorrento, in the little town of Massa Lubrense, an ancient village of fishermen and sailors. The area, in the middle of the Gulf of Naples, with easy access to the excursions in the most famous and fascinating tourist sites in the world: the Amalfi coast (Positano, Amalfi, Vietri), the archeological cities of Pompei and Ercolano, mount Vesuvio, the island of Capri e Ischia. Villa located on the first floor of an independent villa with sea view overlooking the wonderful island of Ischia and Capri. Central and sunny position, looking on a green garden between lemon and orange trees, only 300 metres from shops, bars and the characteristics restaurants where you can taste local food and wine. Activities (on site and nearby): Tennis, Shopping, Sightseeing, Restaurants, Sailing, Boating, Swimming, Biking, Mountain Biking, Wildlife Viewing, Fishing, Fitness Centre/Gym, Health/Beauty Spa, Antiquing, Cinemas/Movie Theaters, Live Theatre, Museums, Horseback Riding. At only five minutes by car from the sea (one and a half km), you can find the lovely fisherman's village of Marina della Lobra where you can join scuba-diving courses or excursions to the enchanting coves of marina di Puolo, Ieranto and the island of Capri.